My boyfriend and I are adopting our first chow chow & have a lot of questions because we are new to the breed. We want to make sure our fluff ball is well cared for! Our puppy is not quite ready to leave his mom but I want to be prepared as soon as we have him. That being said, I apologize for the amount of questions but any advice you have on even just one of them would be MUCH appreciated! Thank you in advance!! 1) I've read a lot of topics on here regarding grooming but the reason I am posting my own is because I would like to know what, in your chow-owning opinions, is the best comb/brush to remove any loose fur but keep the chow as fluffy, lion-like and full of fur as possible? My fear is buying a brush that removes too much fur, i.e. any that isn't loose and shedding. Also, should I begin brushing our puppy as soon as we get him? If not, when should I begin brushing him? 2) What is the best brushing technique to get the lion-like appearance for our chow? Do I comb from tail to head, or from head to tail? 3) What is the best shampoo you would recommend for a beautiful coat and how often would you recommend bathing our chow with it? 4) Aside from when a chow is blowing his winter or summer coat, do they shed much throughout the rest of the year? 5) How do you clean your chows paws when they come in from outside? Any recommended cleaning products if so? 6) Any unrelated advice for us first time chow owners or anything we should know ahead of time to prepare for? Thank you so much for any & all tips!!! 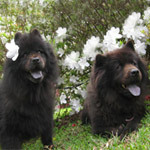 We truly appreciate being able to talk to other chow owners so we can make sure to have a happy, healthy chow. There are probably many opinions on that subject. I have a couple of pin brushes that I like to use. I will brush both with the direction the hair grows and against the growth, and tend to concentrate more on areas that will mat on my dogs. My wife likes to take a damp towel and clean their paws when they come in. This has a lot to do with keeping the house clean, and little to do with the dogs. As far as bathing, that is maybe 3 to 6 months apart, with frequency dependent on if the dog has gotten dirty or is shedding. There are several brands that will condition and help remove shed fur, and those are what we use. As far as shedding year around, we have five dogs and three cats, and there is hair everywhere. I don't think they shed that much except when blowing their coat, but then we try to brush them at least weekly. On Facebook I posted a video of my using a vacuum on my male. He just lays there like a big rug. 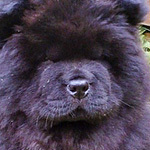 I think Chows are wonderful dogs. Training starts the first day and continues forever. The effort and love you put into the dog will determine just how good the dog is, and it truly is worth all the effort and love. Well done asking questions and getting prepared before hand. I use a slicker brush and do what is called line brushing. It is very very important to get down to the skin with your brushing it allows the air to circulate keeping them warm or cool depending on the season and also goes a long way to removing grass seeds which can work into their skin if not kept an eye on. I start at the head end, lay my palm flat on the neck and pull a small bit of fur out from under my hand with the brush and continue this way creeping my hand and the parting created in the fur backwards. Brushing towards the nose on the whole body in this manner will keep you baby very fluffy and keep their skin healthy and remove tangles, mats and debris from the coat. You may not get the whole puppy don't in one go but you will be working towards it. This is the brush I use on babies and grown chows.....not sure if this is what you call a pin brush. This YouTube is hilarious but has some really good tips....as she says pay attention to the friction areas for mats forming. okay that was hysterical Siriol, never saw someone get so excited about mats and spray in conditioner!!!! Everyone has their favorite type of grooming equipment. I thing everyone should have some type of pin brush, slicker, and comb as well as nail clippers. You will alwo need a small pair of scissors to trim the hair from the pads of the feet. Always remember to put your grooming equipment up so puppy doesn't chew it up. I love this type of slicker because it doesn't break the coat. Its very gentle. Ursa's daddy wrote: There are probably many opinions on that subject. I have a couple of pin brushes that I like to use. I will brush both with the direction the hair grows and against the growth, and tend to concentrate more on areas that will mat on my dogs. My wife likes to take a damp towel and clean their paws when they come in. This has a lot to do with keeping the house clean, and little to do with the dogs. As far as bathing, that is maybe 3 to 6 months apart, with frequency dependent on if the dog has gotten dirty or is shedding. There are several brands that will condition and help remove shed fur, and those are what we use. As far as shedding year around, we have five dogs and three cats, and there is hair everywhere. I don't think they shed that much except when blowing their coat, but then we try to brush them at least weekly. On Facebook I posted a video of my using a vacuum on my male. He just lays there like a big rug. Thank you so much for all of your great advice! I was actually anticipating our chow to need a bath weekly but after reading your post and other topics in this site it sounds like that may not be a good idea. I think we will go with a less frequent bathing schedule. Do you blow dry your dogs fur after their bath? I don't fully understand "hot spots" yet but recall reading an article that mentioned damp fur could cause them. I'm not sure if that is accurate but was wondering if you or anyone else has had that happen to their chow. We're looking forward to the many rewarding challenges ahead with our chow as it seems they are an extremely rewarding breed to own when you give them your time, love & effort. Thanks again for your tips! Sirchow wrote: Well done asking questions and getting prepared before hand. Thanks so much for this info sirchow! I will definitely try your technique to keep our chow nice and fluffy. I hadn't realized that grass seed was such a nuisance for the chow's fur & skin. Perhaps I will give our chow his daily brushing after we take him outside to play due to that fact. Thank you for the video link as well.. it was very helpful as well as entertaining! maikinda wrote: Everyone has their favorite type of grooming equipment. I thing everyone should have some type of pin brush, slicker, and comb as well as nail clippers. You will alwo need a small pair of scissors to trim the hair from the pads of the feet. Always remember to put your grooming equipment up so puppy doesn't chew it up. Thank you for the tips Laura! Do you trim the hair in between your chow's nails as well? I recall reading that it is recommended to trim that area as well. Wanted to know if you find that necessary or not with a chow. I just added the brush you recommended to my shopping cart online. Did you know that the Safari brand also makes a self-cleaning version? It has a handle that you pull to retract the bristles from the brush head, subsequently pushing any hair out of the bristles. I discovered the self-cleaning version while searching the regular one. I think I will give it a try. Just wanted to let you know in case you'd like to try it as well! Plenty of great replies already, but i will add my 2 cents. Pin brush is essential for daily upkeep. Finish brush/slicker is also needed. I also use a comb for around the ears to dispel any knots. And i know it seems like a lot, but i highly recommend a rake to work the back end. Mind you those last couple aren't completely necessary with puppy fur, they are more useful with dogs in adult fut, but regular grooming will likely get them into adult fur a bit quicker. A good household scissor is definitely a good idead for trimming the paw area. You will want to trim the paws so the fur doesnt extend beyond the pad. Particularly if you house has slick surfaces (wood or tile floors). Making sure the paw pads contact the floor prevents slipping/sliding and injuries that result. Chows are very susceptible to knee and hip injuries, and that sliding while doing zoomies is almost guaranteed to result in a limping chow. As for the self cleaning, if you have more than one grooming tool, use one to clean the other. Rory's Dad wrote: Plenty of great replies already, but i will add my 2 cents. Thanks so much for the advice! Fortunately (but not for the pre-potty trained stage) our house is mostly carpet so zoomies shouldn't be a problem but I will be sure to pay attention the the paws when grooming so that we avoid any injuries in the tiled kitchen or on trips out & about. Thanks also for the tips on which brushes to use as a puppy, I will be sure to save the comb & rake for when puppy grows up. I didn't mention this, but start grooming early with your puppy. You don't have to really be serious about it, just go through the motions so that the puppy becomes comfortable with handling. You want to handle his feet, ears, look at his teeth, and handle his tail. The idea is to build trust. At some time, you will need to touch every part of your dog. Having a dog that trust you in all types of handling makes life easier for the both of you. Yes, that's a really good point. And how you do it is up to you. My daughter grooms both the dogs on the floor for daily upkeeps. She just gets a blanket and sits down their with them and brushes away. Good bonding time, but she generally will end up brushing the same spots over and over. Good for them to be accustomed to the process, and they love it, but not the best grooming result. Since we have multiple dogs, we have a grooming table with the arm. She can assist here, but that's my territory. They are well trained in this area and do a very good 'stand' routine. This gets them used to a pro-groomer set up as well as for show events. With that set up i can get a full groom by walking around the table and can get the underside since they are standing. Ursa's daddy wrote: I didn't mention this, but start grooming early with your puppy. You don't have to really be serious about it, just go through the motions so that the puppy becomes comfortable with handling. You want to handle his feet, ears, look at his teeth, and handle his tail. The idea is to build trust. At some time, you will need to touch every part of your dog. Having a dog that trust you in all types of handling makes life easier for the both of you. That's a wonderful idea! I will be sure to start very early and go through all of the motions you mentioned. I plan to brush his teeth as well so handling his mouth should be a good start to him being comfortable with this. Thank you! Rory's Dad wrote: Yes, that's a really good point. And how you do it is up to you. My daughter grooms both the dogs on the floor for daily upkeeps. She just gets a blanket and sits down their with them and brushes away. Good bonding time, but she generally will end up brushing the same spots over and over. Good for them to be accustomed to the process, and they love it, but not the best grooming result. Since we have multiple dogs, we have a grooming table with the arm. She can assist here, but that's my territory. They are well trained in this area and do a very good 'stand' routine. This gets them used to a pro-groomer set up as well as for show events. With that set up i can get a full groom by walking around the table and can get the underside since they are standing. I like the blanket idea.. great idea to catch all of the fur! I'm looking forward to nightly brushings with our puppy as I'm sure it really is a great way to bond with them. Thanks for your feedback! Pin brush and a slicker brush, along with a furminator for when Coco sheds her coat. I've heard that many people think a rake is the same thing as a furminator and the furminator is just hype. Maybe that is true; I just got mine at Petco when it was on supersale. Pin brush is the general brush that I use, and it works well on the areas of longer hair--ruff, tail, legs/haunches. I use the slicker section by section to brush everything out and pull out the matted down hair. For bathing, I use a gentle shampoo and conditioner from Petco. I cannot stress how important it is to rinse an extra time--even after you think you got all the shampoo and conditioner out. Then, I try Coco with a few towels and blow her dry with a blow dryer and a pin brush, with the dryer on coo/warm. Even though I use a regular blowdryer (it is a T3), she dries pretty quickly like this, in like 20 minutes. I cannot stress how important it is to go through the motions with your new puppy so he or she gets used to it. I got Coco as an adult from the SPCA and grooming her is always a challenge. Even if you don't need to bathe the puppy, it might be a good idea to have weekly time in the tub, wet just a little, and then blow out and brush so it gets used to it. as much as I hate to admit it, we shaved our chow I didnt know, please forgive me, but I need help. We decided to shave him because he needed surgery on his front paw pads and would be in too much pain for grooming during his recovery. He looked great when the hair was short and he acted like a puppy, he wasnt shaved all the way to the skin to protect him from sun, but it was really short. It is now growing in like a steel-wool brillo pad. Any advice would be so appreciated.